In the ROADMASTER Rivieras and Sedans — rich nylon fabrics in custom- designed patterns — with tailored cordaveen seat bolsters and instrument panel cover to match — create an air of regal splendor. In the Convertible, you select from four different hues of soft, supple leather . 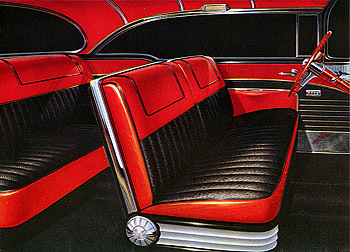 . .
From the 1956 Buick sales brochure comes this illustration of a Roadmaster hardtop interior in bold red, black and chrome. 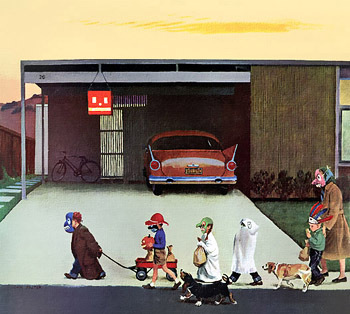 Illustrator John Falter conjures Anysuburb U.S.A. on October 31, 1958, back when pumpkins had corners and cars had bat wings. Happy Halloween! 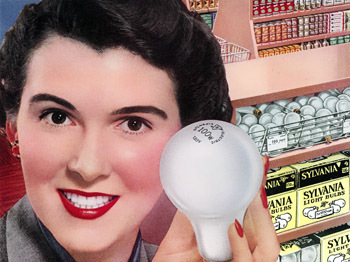 Choose Sylvania light bulbs and you’ll be sure of the best. Made to meet the most exacting demands of lighting efficiency and long life. Tested at every step in their manufacture to make good their slogan, “The Best Light in Sight.” Buy them by the handy 4-pack TODAY! History is in the making at Oldsmobile. In celebration of the fifty years just past . . . in anticipation of even greater years ahead . . . America’s oldest motor car manufacturer is now swinging into production on the first of an entirely new cycle of superlatively fine cars — the Futuramic Oldsmobile. Here is a car so new and exciting, it requires a brand new word — Futuramic — to describe it. A car with styling so daring and dramatic, it’s just as modern as Oldsmobile’s Hydra-Matic Drive. 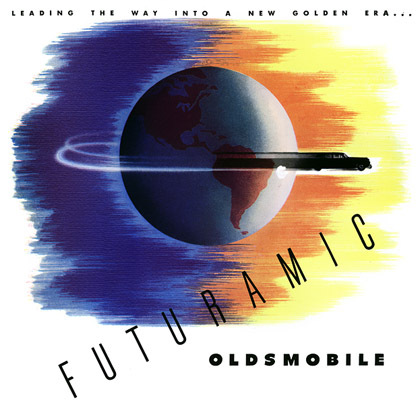 A car so advanced and ahead of its times it heralds the dawn of a new Golden Era in Oldsmobile’s history. Watch for the 1948 Futuramic Oldsmobile at your Oldsmobile dealer’s. From late 1947 comes this ad heralding the arrival of the “Futuramic” Oldsmobile for the brand’s senior 90-series models. The cars, along with the 1948 Cadillac, were GM’s first all-new body design since the end of World War 2. With their integrated front fenders and airy passenger compartments, they set a template that would be followed into the 1950s by other GM brands, and eventually other manufacturers, as the more radical postwar design approaches (concealed wheels, torpedo grilles, “bathtub” styling) proved to be dead ends. 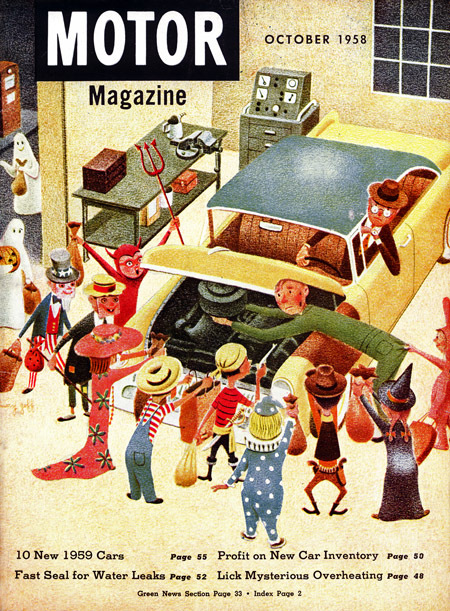 A cute Halloween scene as illustrated by Harry Goff for the October 1958 issue of Motor Magazine, a trade publication for service station owners. Boo! If we were to publish a list of those who own Cadillac cars, it would be recognized throughout the world as an honor roll of contemporary achievement. 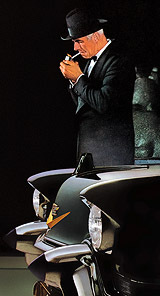 Cadillac stands so obviously alone that it is the instinctive choice of those whose choice is unrestricted. For more than forty years, Cadillac has been built to provide the finest personal transportation that it is practicable to produce. It is only natural that such long and strict adherence to such exclusive purpose should have placed Cadillac in a class apart — should have made it the universal symbol of all that is good and desirable in an automobile. If you are among the many waiting for a new Cadillac — please be assured that we are doing all we can, consistent with Cadillac standards, to further production. The demand is so great, however, that some delay in delivery is inevitable. But hold to your purpose! The reward for waiting was never before so great. In 1946 and 1947, almost every Cadillac print ad contained a perfunctory apology to motorists desperate for a car at a time when civilian production of automobiles had just resumed after a four-year hiatus during World War II. 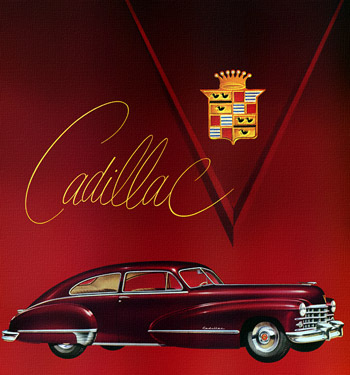 Relieved of the requirement that it actually try to sell the car (for which there was far more demand than supply), the 1946-47 advertising was the most graphically striking in Cadillac’s long history — an almost classical simplicity that seemed to decrease in direct proportion to the rise of the tailfin. ≈ How to Run Away With the Show! Ride “on stage” in style! There’s sure to be a ripple of “oh’s” and “ah’s” when you appear in a new Hudson. Your audience can’t resist its rich color, its smooth styling . . . Spellbind them with action! Scamper uphill, glide along the highway, float through traffic with your Hudson Super Six or Super Eight — anyone can tell it’s a star! See your Hudson dealer now — the sooner you see him, the sooner you can “run away with the show” in your neighborhood! 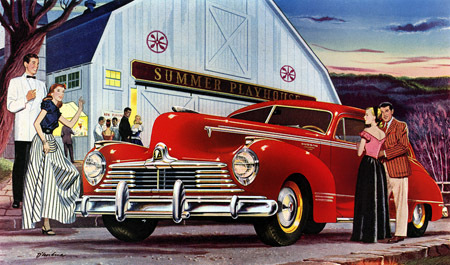 Illustrated by Bernard D’Andrea, the Hudson Commodore for 1947, the last year for this marque before the distinctive but somewhat oddball “step-down” unitized bodies of 1948. Again Studebaker has been first to score with a real advance in truck engineering! 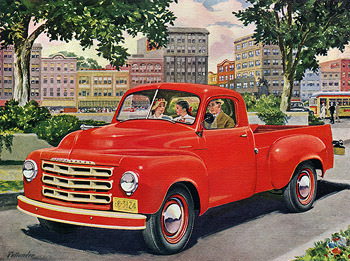 A new kind of truck transmission — Studebaker’s far-advanced automatic overdrive — is available at moderate extra cost in the beautifully streamlined half-ton and three-quarter-ton models for 1950 . . . Ever mindful of what happened to “Peanuts” after it turned into The Comic Strip About Snoopy, we are doing our best to keep Plan59 from becoming TrucksByTellander.com. Still, it’s like scanning fish in a barrel. Someone stop me before it’s too late. What a beating most people take in the summertime! Heat and humidity are two big strikes against them. They’re tired and worn out — often so much so they can’t enjoy leisure hours at home. 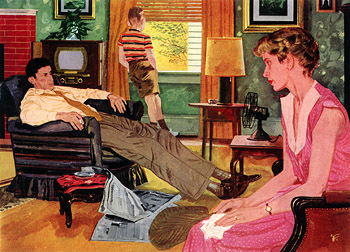 Yet there’s real relief for everyone, at home or at work, in modern air conditioning . . .
Maybe if Dad put on his coat and hat he’d feel better? Just a thought. The artist here is the all-too-modest F.
It’s the gas-saving design of a Studebaker truck that makes it a stand-out money-saver. A Studebaker truck’s rugged structure is free from burdensome excess weight. Stop in at a dealer’s showroom. Examine a Studebaker truck closely. You can see why it saves. Studebaker Corp’n, South Bend 27, Indiana. 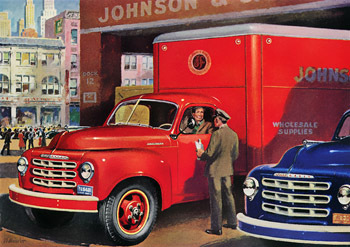 A 1952 Studebaker two-tonner with 15-foot van body as illustrated by Frederic Tellander (1878-1977), the Michelangelo of the mid-century truck. When you see this sort of thing you’ll say . . . Thanks for tires like Seiberling! 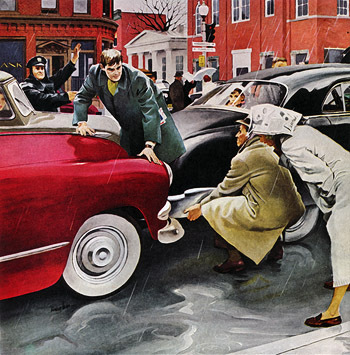 A 1952 illustration by George Hughes of the once common motoring mishap known as locked bumpers. 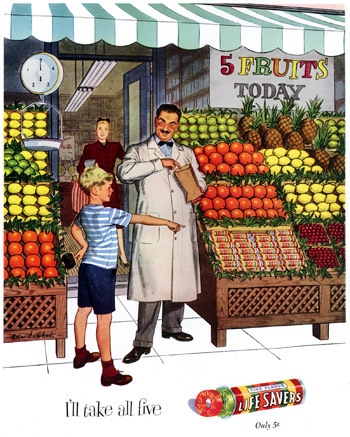 Packaging of fresh foods has revolutionized things for both the grocer and the housewife. Cut, washed, trimmed and wrapped, ready for immediate use, many fresh foods come to you protected against spoilage, dust and germs by a modern transparent film, Celanese Lumarith, an acetate plastic . . . 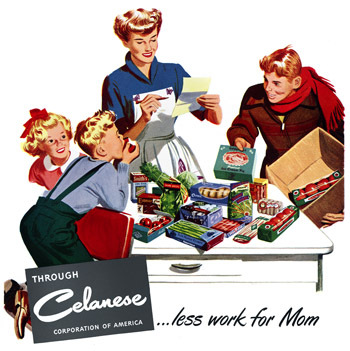 This 1950 illustration for the Celanese Corporation of America is unsigned but looks like the work of artist Glenn Grohe, who died in a fire in 1956. ≈ Keep Your New Car New — Use Gulfpride! Today’s motor cars — including, we’re sure, the one you own — are the finest the world has ever seen. They deserve the finest possible care. They deserve Gulfpride — the world’s finest motor oil . . . 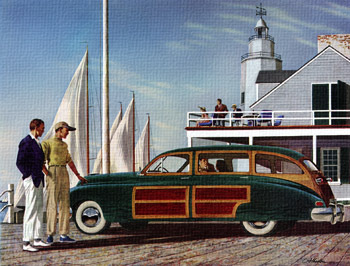 The car in this 1949 illustration for Gulfpride motor oil looks a little like a Packard. The artist was John Atherton, who drowned three years later while on a fishing trip in Canada. Farmer to Packer to Store . 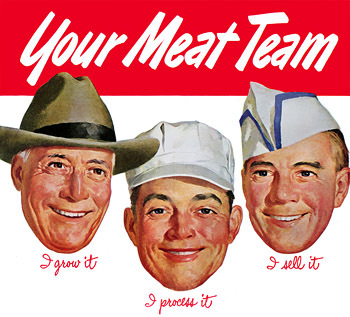 . .
From 1949 and the heyday of the versified ad comes this rhyming tribute to “Your Meat Team,” courtesy of the American Meat Institute. We’ll spare you the final ghastly stanzas. A right smart lad is our little friend Paul! In one pack of these swell Life Savers! Orange! Lemon! And Lime! All fresh as May. Wild Cherry and Pineapple. Try ’em today! 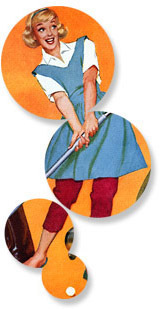 Artistry trumps poetry in this rhyming Life Savers ad from 1947, deliciously illustrated by Oskar Barshak. Listen a little and watch a little! Watch the man or woman, the husband and wife, who have become Dodge owners after years of limousine habit and experience. They almost lose their dignity in the fun they get and the way they carry on. You’d think they were getting their first automobile thrill, and in many cases they are. One thing is certain, — Dodge has a strangle hold on the affection of every owner, and with many of the new ones, it’s a happy honeymoon, nothing less. 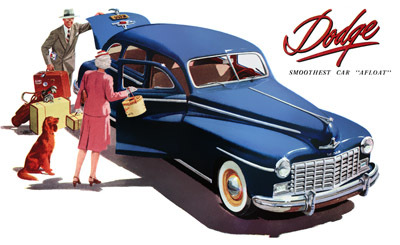 One in a series of appealing ads for the 1947 Dodge that showed the cars from above in three-quarter views on a white background. The artist signed his name Osler. Make sure of long-lasting, long-range operating economy! Get Studebaker’s thrift-assuring overdrive transmission, if you’re thinking of buying a new half ton or three-quarter ton truck. This revolutionary Studebaker forward step in truck engineering is extra cost — but it starts paying its way right away in extra thrift . . . Check and compare. 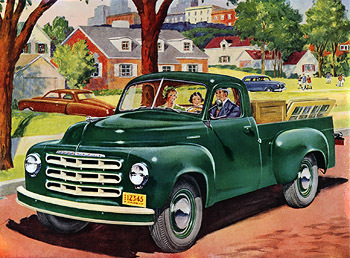 See why exacting business men everywhere are buying more and more new Studebaker trucks. Yet another Studebaker as rendered by Frederic Tellander, a kissing cousin to the red truck farther up the page.